In searching for the people who may have constructed the seemingly artificial features in the buried walls of Rockwall, Texas I had been stymied by the absence of any stone working culture within the confines of the dating of the uppermost sections of the walls. Since the Holocene depositions of sediments covering the topmost portions placed them at the Terminal Pleistocene/very early Holocene, the logical conclusion was that the modifiers were at least Paleoindians. Historical testimony gathered by Dr. Glen, however, did indicate that low capped sections of the walls were exposed throughout Rockwall County when the first Angloamerican settlers arrived in the mid-19th century. These were soon scavenged to serve as foundations and footings for dwellings in a region notably devoid of surface stone suitable for such purposes. Brief mention had been made by Rafinesque around this time of a stone circle found in Northeastern Rockwall County by an early explorer around the time of intense interest surrounding the stone components of Fort Ancient and other Midwest earthen mounds. As Rafinesque was already held in low esteem along with Schoolcraft and other Moravian missionaries advocating an advanced unidentified culture which had preceded the contempory Indian groups such as the Lenai Lenape, this brief report was banished to obscurity in short order. Eventually, I located it online but as with so many of these 19th century observations it was difficult if not impossible to pinpoint an exact location to determine if it still existed or ever did for that matter. However, it is consistent with other sites including a stone circle with several skulls discovered by the late Dr. Griffiths in Fannin County in the ’80’s. (Dr. Griffiths died in a car accident before he could pinpoint the location for the late Tom Scot, curator of the Fannin County Museum of History.) The skulls which he had retrieved were apparently lost in the fire which destroyed his house subsequently. Based upon Tom Scot’s recollections, I vainly searched for the site several times and came to the conclusion that it had likely been destroyed in the construction of boat ramps and other improvements made on a local lake close to where I thought the discovery had been made. At any rate, it became apparent that the various mound building cultures had used stone to a limited degree where it was available. At that time I was not particularly interested in such late cultures until it gradually became apparent that such cultures did comprise an element of the upper components of the buried walls. Archaeological investigations of associated sites such as the Upper and Lower Rockwall sites suggested even earlier occupations by distinctly different (physically) groups well into the Archaic. Still these seemed to be the well known nomadic hunter/gatherers who did not even possess ceramics or bows and arrows until the last stages of their occupation in the Late Prehistoric. There was no indication that they had any interest in stone building or even permanent settlements. It seemed that their sites were more like seasonal camps to which they returned over a period of hundreds if not thousands of years. This view changed for me somewhat when I found a report from King Harris, a well respected avocational turned semi-pro, in the ’30’s. Harris had found at a campsite one eighth mile from the main channel of the East Fork of the Trinity. Along with ceramics, kilns and projectile points there were the ruins of a sun fired brick structure. Questioning the oldest residents he found that they had not been built by the earliest settlers but had been there when they arrived and discovered them while clearing brush for farming and herding in the East Fork bottoms. In such a wet climate sun fired brick was not known to have been used by either Anglo settlers or previous Indian cultures of the region. Needless to say, Harris’s discovery now lies beneath the waters of Lake Ray Hubbard along with any number of other archaeological sites discovered by Harris, Stephenson and countless other avocationals in the hasty surveys done prior to the construction of Lake Lavon and Lake Dallas in the ’50’s. Harris’ “Indian Campsites of the Upper Trinity” and Stephenson’s survey of the Trinity drainage are still to be found in reprints of the old Texas Archeological Society bulletins but serve as much to tantalize as to illuminate. Even more intriguing, within the pages of these old bulletins are articles and observations, such as E.A. Hooton’s “Notes on Five Texas Crania” which is an analysis of Ernest Adams’ discoveries on the Brazos in Somerville County of some atypical skulls;dolichocephalic with pronounced orbital ridges. Only decades later with the discoveries of the Horn Shelter remains, Spirit Cave remains and Leanne (Wilson-Leonard) was the significance of these earlier finds slowly recognized and accepted. With the debut of a new exhibit at Texas Beyond History http://www.texasbeyondhistory.net/cairn/index.html recognition and acceptance should disperse more widely. I consider Texas Beyond History to be the most excellent site presently available in terms of solid factual educational material for the layman and avocational alike. In addition to photo material not previously seen by the general public, there is updated material from later archaeological investigations such as that done by Darrell Creel in the 1980’s. A map of the currently known stone cairns of Texas is also expanded from the days of Cyrus Ray, E.B. Sayles, King Harris and other pioneers of Texas archaeology. I might also add that it connects more than a few dots for this particular anarchaeologist and confirms a great deal of what I had already dug out, fingernail by fingernail, in the last decade groping in the murky informational wasteland surrounding the Rockwall phenomenon. While I have never needed nor requested benediction of my arcane inquiries from any ordained minister of science, it is truly gratifying to see some of my sources and predesessors in the dissident mainstream community vindicated publicly. To my regret most of them never lived to enjoy the moment. Despite this latest unveiling providing me with the stone using people capable of modifying the buried walls of Rockwall, it does not, as yet, provide a solid connection between these Archaic and Late Prehistoric people and those modifications. Moreover, despite signs of stone modifications and symbol sytems at Paleoindian sites such as Gault’s cobble pavement and inscribed limestone tablets and Levi Shelter’s boulder-improved overhang shelter, I have nothing Paleoindian directly in association with Rockwall. To assert that the suspected architectural and epigraphic features found as much as 30 feet or more beneath the Holocene sediments in Eocene formations are Paleoindian or even pre-Paleoindian would require extraodinarily old artifacts in direct undisputed context. A Heidlebergensis burial with hematite handaxes and gnawed gomphothere bones would be nice but I’m not even sure that would do the trick. For now, megalithic cyst burials on high ridges in West-Central Texas are very encouraging. As a companion piece to the FAQ on Rockwall, Texas I am presenting this C&P from the soon to be defunct Ishtar’s Gate forum. This was in response to a new member’s query regarding the infamous “A Phoenician Fortress and Furnace in Oklahoma?” which I wrote for Gary Vey’s Viewzone online magazine. Just as the entry on Rockwall allowed me to organize and update my observations, this entry serves the same purpose. It also reiterates the history of how these two subjects came to be intertwined. Just consider this another FAQ and update on the evolution of the observations and opinions I held in 2010.
stephjn wrote:Can any of you shed any light on this article for me? A Phoenician Fortress and Furnace in Oklahoma? First of all bear in mind that article was written a few months after my wife and I discovered “The Phoenician Fortress” September 10, 2000. The account is accurate though my interpretations were naive. For a reassessment, read my introduction at http://www.anarchaeology.com written a couple of years later. I should revise that assessment even further through the lense of a decade of research and experience which separates my initial discovery and what I now consider to be best evaluation of that site. First of all, the “fortress” is largely a natural phenomenon, that is, a formation of mineralized joint fractures formed initially in the Pennsylvanian. Since that discovery I have found other examples of this formation throughout Eastern Oklahoma and even specimens in North Texas where I reside. When I first posted the photos online they were generally accepted as artificial structures because few, if any viewers had ever seen anything like them. Geologists and skeptics asserted that they were common as dirt, liesgang banding. Yet it took several years of dedicated scouring to find images to post online. By that time I had already found them myself, thanks to dialogue with more diplomatic geologists and rockhounds. The tesselated pavements of Eagle Hawks Bay are probably the closest match, though the Carpet Rocks of Petite Jean Park in Northwestern Arkansas are even closer as they are more closely geologically related. What is most usual about the “Fortress” is that the formation is vertical rather than horizontal and unlike the similar formations on cliffsides in Southern California, these form freestanding walls in several locations (see many more photos at anarchaeology.com in the galleries). These bear more resemblence to clastic sand dikes or sills, but having delved into that subject even more deeply than orthoganal joint fracturing, the mechanism is distinctly different. The distinctions became more apparent as I researched ever more deeply into the shale-buried walls of Rockwall, Texas (an extensive set of galleries can be found in the Quivira Project section at Anarchaeology.com which I took over after John Lindsey left after a serious illness and change of location to West Texas). That is the current focus of my research and the discovery of the “Phoenician Fortress” was what led me to become Lindsey’s assistant and primary field researcher shortly thereafter. Finding any possible cultural associations with the two projects was the primary motivating factor in both. As far as the “fortress” goes, the only cultural association that can be confirmed by mainstream archaeology is that of a late Archaic group (1,200-1,500 BCE) utilizing the individual blocks as fishweirs on the Kiamichi River discovered by the Oklahoma Archeological Survey in the mid-90’s. The manner of quarrying and shaping the blocks was taught to Anglo-American settlers by indigenous tribes removed to Oklahoma in the 1830’s. They, in turn, no doubt learned the technique from Caddoan groups whose direct ancestors had built the fishweirs and stone foundations found elsewhere in Eastern Oklahoma and perhaps influenced the builders of the Buried City in Ochiltree County Texas and the Antelope Creek Culture of the adjacent Cimarron County in the Oklahoma Panhandle, though these are much later constructions. A definite trade relationship existed between the Pueblo IV culture of New Mexico and both the Caddoans of Rockwall Texas and Eastern Oklahoma. How much, if any, of their masonry technique was exchanged is also part of a current research project of mine. In the same area of the “Fortress” Meeks Etchison, a former archaeologist for the Ouachita National Forest, described a discovery of what sounded to me to be the “Terra Preta”, an artificial soil of the Amazon. This was on a bare limestone ridge far from a convenient source of water. This is the the only faint hint of a connection with South America which I early on surmised due to correspondence with Buck Buchanan, an assistant to the late Gene Savoy who discovered the Cloud Cities of the Chachapoyas. Again, I have come to think that the Chachapoya culture came much too late to have an association with various sites in Eastern Oklahoma, though I still think there might be some earlier connections from South America. That is highly speculative on my part at this stage. As to Gloria Farley’s Phoenicians/Punic inscriptions, I found no evidence of them after extensive surveys of the “Fortress” and lately I have come to think that she misinterpreted a pre-alphabetic symbol indigenous to the Americas. Again, refer to the latest gallery at Quivira at Anarchaeology.com for some examples from Texas, Oklahoma and Northern Mexico which supports my view. I still retain an open mind regarding pre-columbian Phoenician contact, but I no longer think it has any direct bearing upon the sites in which I am focused in Oklahoma and Texas. There is a more intriguing possible connection with Upper Paleolithic symbols from the Old World but again, that is extremely tentative at this point, and deserves a separate topic of discussion. I have drifted quite a distance from the Hyperdiffusion stage I passed through enroute to where I am now and Bronze Age contact holds very little interest to me at this time. What I am interested in is, I believe, indigenous and predates the Phoenicians by thousands of years. The “Phoenican Fortress in Oklahoma” is something of an embarrassment which I shall have to live with to my dying day as it has assumed something of a life of its own which will no doubt outlive me. Live and learn. If you have need of any more specific clarifications, I will do my best to provide them. A few weeks ago I dropped by the museum run by the Rockwall Historical Foundation to obtain O.L. Steger, Sr.’s History of Rockwall County 1842-1968. In the course of making that valuable acquisition, I had a long, productive discussion with the museum’s curator, Deb Mahon. The happy result of this extended conversation was that Deb called me a couple of weeks later to ask permission to give out my phone number and the url to Anarchaeology.com to visitors who dropped by inquiring about the buried wall phenomena. Of course, I granted permission, as I am always glad to answer questions on one of my all time favorite subjects and exchange information with those with similar interests. It occurred to me after a long, rambling phone discussion with one Deb had referred to me, that it might be more efficient to answer many of the frequently asked questions here in order to bring newcomers up to speed more efficiently. The following is a repost of the first of a series of posts I made at Ishtar’s Gate beginning in 2009. It begins with an inquiry from Ishtar on concerning the Sanders Stone used as the logo for the Quivira Project, which my son, Nick Anderson, and I made for John Lindsey in order to present his Rockwall research to the online community. Naturally the post rapidly expands to address numerous other aspects of the phenomenon, including research I later made on my own in the course of assisting John to put together his book on the subject. Others will follow. That (the Sanders Stone photo in the latest set of galleries, page 1) is the only picture extant of the inscribed stone found some 30 feet below the surface in 1949 (which just happens to be the year I was born) by a “Mr. Sanders” of Fort Worth, Texas. I have diligently searched for the identity of Mr. Sanders to no avail. All the people in Rockwall who knew his full identity are now dead. The photo was included in Dr. Glenn’s photo essay done for the Sesquecentennial in Rockwall around 1952 and reprinted in 1976. I am most fortunate to have a copy. The photo used as a logo for the Quivira Project of John Lindsey is a mirrored image of the original turned on its side with the measuring stick and glass jar full of “black gumbo” mud removed and the part of the symbol which it obscured completed. Otherwise the photo is faithful to the original that Mr. Sanders and Dr. Glenn made in 1949. The black mud, which forms the upper layer of the Blackland Prairie, was obviously rubbed into the inscriptions to make them more visible to the camera. They are similar to other pictographic inscriptions found on other stones removed from the walls. Those however were left exposed to the elements and weathered to the point they had become all but indistinguashable. Fortunately, Dr. Glenn took photos of them and I believe they are reproduced at Anarchaeology.com as well. Dr. Glenn saw a goddess and turtles in them; John Lindsey, who saw them when they were still faintly distinguishable thought Dr. Glenn was seeing “faces in the clouds”. That is quite a statement from a man who sacrificed his professional career investigating and defending the artificiality of the walls. In examining the photos, I still find them extremely ambiguous but can easily see what Dr. Glenn saw. I should mention here, that Dr. Glenn was a Presbyterian minister who had worked with the Seminoles of Florida before relocating to Rockwall. The walls became a lifelong preoccupation with him, though he was a devoted historian of Rockwall’s development and preserved the oral histories of Rockwall for posterity. Dr. Glenn saw Mesoamerican influences in the wall, Aztec and Maya, and interpreted the artifact he found near Royce City near a section of wall as a representation of Quetzalcoatl. Bob H. Slaughter, a vertebrate paleontologist from SMU pronounced it the upper portion of a fossil skull of Tylosaurus prolinger, a marine dinosaur of the Upper Cretaceous. John Lindsey had the artifact x-rayed in order to prove that the object was not a fossil. According to the terse lab report I saw, it was not. John later took the object to the Navajo (who curiously enough knew of this obscure architect from Rockwall and were waiting for his unannounced arrival). The Navajo said this object was known to them and gave John instructions for reconstructing it in plaster from a moulage mold of the original, which was done with the aid of a local sculptor. The goat-like figure at the top of the logo at the Quivira Project is that reconstruction and inside the galleries there you can see a good photo of the original. The inscribed stone was on display in the basement of Rockwall County Courthouse for many years until it was removed in the middle of the night to a private residence. As the courthouse was also the jail and a police station, the removal of a two ton stone some six feet in length was not a casual burglary. John learned of the current location and was advised to drop the matter by a high ranking Rockwall official. From there I can say little more as it gets into the murky small town politics which have hampered investigation of the walls for over 150 years. I have during my own involvement with this phenomenon learned to steer well clear of that element as it extends very high into levels of organizations I do not wish to antagonize. I’m sorry if that sounds like conspiracy paranoia but one ignores it at their peril. Sanders’ inscribed stone is but one of several pieces of evidence whose very existence has been jealously guarded for well over a century. My own ideas derived my personal end of the investigations are at very wide variance to those of others who have looked in depth at the buried walls. After nearly ten years I have far more questions than answers. I have looked into the mainstream explanations for the phenomenon as deeply as my intellectual abilities will allow but barring taking several university courses in sedimentary geology and physics I have just about come to the event horizon of my limitations. These mainstream probings had me almost completely persuaded to natural formation point of view but there remained within me a deeper, perhaps arrational, conviction which overides that persuasion. It was due to these inner convictions that I persisted in exploring the artificiality theory. At the same time, my investigation into the matter with all the objective rationality I can muster, leads me to reject the majority of alternative theories regarding the age of the modifications to these walls. With regard to sacred sites and alignments, I can only say that that aspect but touches upon the surface, literally, of the Rockwall phenomenon. The anomalous piezoelectic properties of the walls may indeed bear directly upon the choice of the Amerindians sacred site location there and there may be, for lack of a better word, metaphysical connections. However, as nearly as I can determine, the walls themselves date beyond current accepted knowledge of human existence. Certain aspects of the walls extend back to the formation of the continent. With no disrespect to anyone, the sacred sites and alignments’ relationship to the buried walls and their modifications are analogous to that of the Baptist churches of Arlington, Texas to the Cretaceous fossil beds recently discovered there. But in that analogy lies a connection to a breakthrough I recently made with regard to the walls and their dating. That a greater portion of the walls are a natural phenomenon is not debated even by John Lindsey, the staunchest advocate of the artificiality of certain features they contain. John’s attempt to place these modifications at mere 12,000 years is where we part company theoretically. The staggering dissonance between the geological data and the modifications which appear to be the product of intelligence was the first seemingly insoluble contradiction I encountered in an attempt, to use geologist Bud Shelton’s term “make the walls younger”. Bud later admitted his inability to do so. And this was before his 180 degree about face to a position of complete skepticism. However, the key to doing that was right before him since 2000 when Dr. Wulf Goss, a preeminent paleomagnetic expert from the University of Texas who was hired to do a paleomagnetic survey of the walls, determined their formation to be 50-55 million years as opposed to the long held geological date of 80-90 million years. This fact had eluded Brooks Ellwood, another preeminent paleomagnetic expert geologist, in 1976 when he did the first paleomagnetic study ever done of the walls on behalf of the City of Rockwall which intended to build a public exhibit of them. Now pushing the walls from the Upper Cretaceous into the Eocene did little for the artificiality theory at the time I (re)discovered this crucial bit of information. However, discoveries of the past two years in Texas and elsewhere opened a path in the deadend wall of inquiry where I had found myself for several years. These discoveries revolved around a number of new species of Eocene primates in Texas and the Upper Cretaceous fossil beds of Arlington, Texas containing large numbers of terrestrial and semi-aquatic faunal remains. Arlington lies upon drainage of another branch of the Trinity River west of the branch known as the East Fork of the Trinity. Lake Ray Hubbard is the lake formed by damming the East Fork in 1965 and some of the most intriguing features of the buried walls, such as the red iron oxide cemented stairsteps, a broached chamber, and mineral springs, now lie beneath its waters. This post has become exceedingly long due to the powerful fascination the subject holds for me. But in conclusion I will say that a major part of that fascination is rooted in personal experiences which are far removed from earth sciences and archaeology. This would appear to be an April Fools joke. 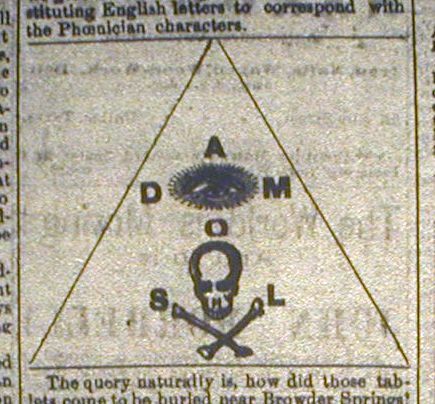 The image of “Phoenician” symbols appears to be the work of some local Masonic lodge member. It is similar in tone to the bogus article containing the byline “Sam Slick” reporting on the exploration of a subterranean chamber near Rockwall. A few scraps of fact are buried in the obscure 19th century humor. While checking web stats for Anarchaeology.com I came across this item which was posted at the Dallas Hisorical Society forum in 2003. There is another on Rockwall in 1907 mentioning the arched passageways and the discovery of a mammoth fossil in a Dallas gravel quarry, which distracted the author from further investigation. George Wilson in his 1949 Masters thesis on the geology of the Southern Rockwall Quadrangle mentions the discovery of a mastodon between Rowlett and Rockwall near what is now Chiesa Road but neither have been associated with the buried walls directly. Pranks such as the following are typical of 19th century humor and provide no end of frustration in trying to sort fact from filler in these old newspaper accounts. It is a fact well known in this city that in the many excavations, diggings and borings that have been made by the Water Supply company, and others around Browder Springs, numerous geological and zoological specimens have been found. The teeth and different bones of mastodons on different occasions have been dug up, and fossilized shells, and not a great while ago at a considerable distance under the surface, Mr. Duncan, City Engineer, while getting out gravel near these springs, found a number of eggs of either some member of the saurian species, or of some large fowl, the shells in a perfect state of preservation. The waters of these springs being strongly impregnated with lime, seem to have a tendency to petrify animal and vegetable matter. These specimens that have been found, go to show that this country, in the ages past, was the home of the mastodon and other orders of the animal kingdom long since extinct. We find, too, in various parts of the Union, traces of the existence of peoples who lived centuries ago, and who have left behind them no mark to tell who, or what, they were, save these traces as shown in pottery, in hieroglyphics and in the bits of skeletons of themselves found in the mounds, many of which, have become noted and about which much has been written, both in prose and poetry. Col. L. J. Dupree, formerly editor of the Austin Statesman, but now in Washington, has investigated the subject of the mound builders, and written a number of papers for Harper’s Monthly and other magazines, about them, and he has also poetized on the subject. In some parts of the country, too, walls and the ruins of seeming fortifications have been found, erected by hands that centuries ago, crumbled into dust, the hands of a people far more intelligent and advanced in civilization than any of the Indian races found in America. All these things lead the cultivated and informed people of the country to believe that this country, in the long ago, was inhabited by a race or races of people who had advanced as far in the arts and sciences as obtained in the days of Hiram, when Solomon was building the temple at Jerusalem, and when the mighty tomes were being gathered into the great library at Alexandria. Yesterday, while some excavations were being made at Browder Springs, at the depth of some twenty feet below the surface, three tablets of a peculiar nature were discovered. They were rough and encrusted with dirt when first dug up, but their triangular shape and a ringing sound they emitted when struck with a pickaxe, arrested the attention of the workmen, and they stopped to examine them. The dirt was scraped off of them and they were then washed clean. They seemed to be petrified wood, but were perfect, no part having decayed on one of them, the other two being somewhat defaced. As we said, they were triangular in form, being isosceles triangles, the sides of one being six inches in length, and the other two, four inches. A description of the large one is a description of all, and we give it. Near the apex is a letter, and immediately underneath it, the figure of a human eye, on each side of which, is a letter, and underneath the eye, another letter. Underneath this last letter, is a skull and cross-bones, on either side of which, is a letter. The two smaller tablets have evidently the same symbols on them, though they are defaced apparently by the decay of the wood. The human eye and the skull and cross-bones are the work of a master hand. No wood engraver of this day and time could make better. The letters are old Phoenician characters. The tablets were brought to the HERALD office, and to decipher the heooglyphics was the work of the hour. Research soon revealed the fact that they were Phoenician characters, and corresponding with our letters, A. D, M, O, S, L. Below we give an exact diagram of the tablet, substituting English letters to correspond with the Phoenician characters. The query, naturally, is, how did those tablets come to be buried near Browder Springs? That they had lain in the earth there for centuries, there can be no question. The earth above them was the gradual, slow formations of long, long years. Dynasties and empires passed away and generation after generation was called to their final account during the years they have lain there. Ethnologically, the Phoenicians were Arabs, or connected with the Arabian family. Nomadic in nature, they were disposed to roam over the face of the world, and we can readily believe that they found their way to America, wandering through the wilds of Asia, the snows of Siberia and across Behrings Strait, either in boats improvised for the purpose, or perhaps upon the ice, to the American continent. Once on this continent, they could, without much difficulty, each this portion of it. They were dark in color, as our Indians are, and it may be that the American Indians is descended from this people. The Phoenicians, we known, made the first alphabet and originated mathematics. We know, too, that they were skillful workers in gold and silver, iron and brass, and that the products of their looms were prized over the then known world. They were proficient in letters, arts and the sciences. Hiram, King of Phoenicia, sent to Solomon when he was building the temple, an artist skilled to work in gold and silver, and stone and timber, and who could grave any manner of graving. They had a religion of their own, and wherever they wandered, they clung to the traditions, legends and ceremonies of their country. Is it impossible that these three little triangular tablets, with their Phoenician letters to speak for them, are not relics that speak to us from the grave of buried centuries, to tell us that once, where we now live and boast our intelligence and civilization, a people lived equally as intelligent and learned in handicraft as we? This is but speculation, it is true, but the tablets are here, and can be seen by any one at the office of the Water Supply company, on Austin street. – April 1, 1880, Dallas Daily Times Herald, p. 4, col. 3. “An exact diagram” of the mysterious relic. Report is Made of the Investigations in Rockwall County– Ruins of Ancient Walls Found Beneath the Ground. The writer was in Rockwall Monday and can report a great interest of its citizens in excavating the buried wall that seems to inclose Rockwall and its environments. The excavation commences at the old well, which was dug over fifty years ago, when the wall was first discovered. The space uncovered is about ten feet long by four feet wide, and it has the appearance of any wall made of brick, even and mortared between, although the brick is not of modern size, as they are longer, and have the appearance of being patted out by hand, and in places where there had been a deficiency in thickness, it had been chinked by a piece fitting in. There was a scale of what seemed to be stucco that the excavators had removed, necessarily, with their picks. This, was, I should judge, about three to five inches thick. One can hear all sorts of stories about this wall in different localities. Some of the wise ones think it is a freak of nature, and some, a volcanic substance that nature provided to fill up a fissure running in a straight line for miles and circling a radius of six miles in length. But, there is no volcanic substance in that wall. There was a story brought just before I left Rockwall on Monday, from another point, where there was some more investigating with a pick, that they had uncovered an arched gateway. We did not stay to investigate it, as we intended to do the next morning, but had a hasty call home to investigate the death of a very ancient and magnificently large animal that found its last resting place about one and a half miles east of the Fair Grounds in Vilbig Bros.’ sand pit. With the co-operation of Dr. J. M. Martin and wife, who are deeply interested in this branch of science and patriotic for Texas concerns, I was able to reach this interesting place early Tuesday morning by automobile. This was a sight, indeed. The whole fossil of the tremendous animal was complete before it had been dislocated from its sand bed. Now, the fossil is much broken, and parts have been dragged away in the sand. This animal is what geologists call a mammoth. It is larger than the mastodon, and differs in many points. Its tusks, which measure ten and a half feet long and girth, twenty-six inches at the base, curve upward, while a mastodon’s are smaller in girth and curve downward. The head is much larger, and in many respects, differs from the mastodon. The mammoth has been found frozen in the icebergs of the North Sea in a good state of preservation, consequently, a good description has been given and preserved by scientists. This is the description given by a Russian engineer by the name of Benhendorf, who discovered one in the frozen North near the shores of the Lena: Picture to yourself an elephant with a body covered with a thick fur, about thirteen feet in height and fifteen feet in length, with tusks eight feet long, thick and curving upward and outwards at the ends, a stout trunk of six feet in length, colossal limbs of a foot and a half in thickness, and a tail, naked to the end, which was covered with thick, tufty hair. His parchment-like large naked ears lay fearfully turned up over the head. About the shoulders and back, he had stiff hair about a foot in length, like a mane. Under the outer hair, there appeared everywhere a wool, very soft, warm and thick and of a yellow-brown color. As compared with our Indian elephants, [missing text] and narrow, but the trunk and mouth was larger. According to the description of Benhendorf of the dimensions of his Russian mammoth, this Texas specimen is much larger. A party of scientists from Chicago university are exploring India for the ancestor of the elephant, which it is generally thought to be. This was Darwin’s theory. Steel says the fossil mammoth is about one-third larger than any elephant of modern times. This fossil belongs to the past teriary period. We have another fossil of the ammonites of the Silurian age, just found by one of our party at Garland. It belonged to the Silurian sea period, when Dallas was on the shores of this sea or the Gulf coast. It derives its name from the resemblance to the horn, which decorated the front of the temple of Jupiter Ammon, and the bas reliefs and statues of that pagan deity. MRS. M. L. LE MOREAUX. – August 18, 1907, Dallas Daily Times Herald, Sec. II, p. 3, col. 6-7. The following is an excerpt from a personal communication I received from Paul V. Heinrich after having sent him a fragment of the Rockwall stone and mortar. Note well his comments on the igneous vs. sedimentary origin of the stone. Other exchanges in the ’90’s between geologists Shelton and McKinney discuss the possibility of this being a hydrothermal sill or dike. I will have more to say on that possibility and others at a later time. The following was posted on the old Anarchaeology.com forum in 2005. The following is an excerpt from a communication with Paul Heinrich, a geologist at LSU regarding some samples of the Rockwall stone and mortar material. It should be noted that in 1874, Richard Burleson, the first geologist to examine the walls, thought they were an igneous formation extruded from below which did not extend above the surface. It was Dr. Robert T. Hill in 1901 who first proposed that the walls were sedimentary in origin and the results of processes which formed the Balcones Fault which he assumed ran through Rockwall. This assumption was refuted by Dr. John T. Lonsdale, Director of the Bureau of Economic Geology of the University of Texas, in January 13, 1959, when he published an article categorically stating that the Balcones Fault ran no further than Hill County. Further he added that the Mexia Fault which runs through Hunt County and east of Rockwall had no involvement in Rockwall or Collin Counties. The latter are the two counties which evidence the buried wall phenomena of Rockwall. William P. Niven, a practical geologist, archaeologist, and mineralologist, among his many other talents, figures greatly in the following story. Niven discovered buried cities in Mexico, notably, Atzcapotzalco, which he and a German geologist assessed to be 12,000 years old. Niven’s just claim to fame was largely overshadowed by Col. James Churchward who incorporated Niven’s very real discoveries into a series of mystical fantasies centered around an Atlantis-style sunken Pacific continent he called Mu. Mu itself, seems to be a conflation of the discoveries of Augustus LePlongeon and the writings of Helena Blavatsky, though Churchward claimed much of it was derived from his own research and discoveries. Whatever his source, William P. Niven’s discoveries were, in my opinion, vastly more significant. When I recently went to my bookmark on Barringer Hill, I found it was gone. Fortunately it had been archived elsewhere and so in the spirit of preserving this fascinating, informative information here as a kind of backup. At times during the 1990’s, Lake Buchanan in central Texas has looked a little low. During the Drought of 1996, racked mud flats and ghostly tree stumps created a damp, stinking moonscape on what is usually the lake bed. Water-skiers, fishermen, and anyone who got water from the lake looked to the skies and prayed for enough rain to raise the lake level. Not so for geologists and rock hounds! Secretly, they wished the lake would continue to fall– by about 90 feet or so–far enough down to expose what the United States Geological Survey has described as one of the greatest deposits of rare-earth minerals in the world: Barringer Hill. The origins of Barringer Hill lie deep in the past. Around 1.1 billion years ago, North America was on the march. As slowly churning convection currents in the mantle pushed the continent along, the relatively thin ocean crust of some long-forgotten ocean was being overrun and pushed deep into the mantle. When this wet ocean crust and its covering of sediments got deep enough and hot enough it melted and expanded. Now buoyant, this blob of magma, now called the Lone Grove pluton, melted its way upward through the thick continental crust of Llanoria. As it neared the surface, the magma began to cool. Some of it may have even risen far enough to stoke the cauldrons of volcanoes. At a depth of about 20,000 ft (6 km) below the surface, crystals of hornblende, biotite, feldspar, and muscovite started forming, creating a 2000°F (1100° C) granite slushy. As it cooled slowly over millions of years, this molten slush and the surrounding rocks contracted and cracks opened. Water, volatiles and the minerals with lower melting temperatures filled these cracks because they were still liquid. Among the last elements to crystallize were the heavy metals because they were too big to fit into the crystal lattices of ordinary minerals. Carried along with the molten silica and other fluids, they found refuge in a common place and crystallized. The minerals were deposited in this pegmatite in two distinct phases: a magmatic and a hydrothermal phase, which are described in detail by Landes (8). At this time simple life forms like bacteria and algae had colonized the sea. The land, however, was as barren as Mars except for a few algae covered hot springs. As time marched on, the overlying mountains were eroded away and the pink granite plutons exposed. Later, when the supercontinent Pangea formed, the mountains of the Ouachita orogeny were built up just to east as this crustal block collided with western South America. After Pangea broke up these mountains were eroded away completely and the Cretaceous sea of central North America flooded the area laying thick sequences of limestones from Texas to the Arctic. Only in the last few million years did the Colorado River grind away at the bedrock to finally uncover this pegmatite in all its glory. And glorious it was! To those who visited the area soon after its discovery, Barringer Hill made quite an impression. Frank L. Hess, who wrote a study of the area’s rare earth elements in 1907, describes it as being composed of “graphic granite of supreme quality, having interlocked crystals of clear quartz and brown colored microcline . . . with distinct white bands. Between the bands, the quartz is glassy and clear.” Like Barnes, he mentions a large, 40 foot wide quartz mass in the center of the pegmatite, but he also describes other geological wonders, such as a cavity “lined with smoky quartz crystals reaching 1,000 pounds or more in weight” and sheets of mica up to 3 feet across and an inch thick. Barringer Hill was named for John Barringer, a young carpenter who acquired the land in 1886 as part of as swap, when a Mr. Wills was unable to pay him the $50 due for a house he’d just had him construct. Mr. Wills considered it the most worthless part of his farm, and most likely felt he’d come out ahead on this deal. What good was a chunk of rocks in the middle of a floodplain, anyway? Barringer, however, soon realized he had something of interest. In 1887, he stumbled upon an outcropping of heavy, greenish-black ore while prospecting. Evidently, once this deposit was discovered conventional wisdom about the area also changed some. Between 800 and 1200 pounds of the mineral were carried off as curiosities by local people in the late 1880’s. When Barringer stumbled onto the ore, no one knew what it was; nothing like it had ever been seen before in these parts. That was about to change. Late in 1887, Professor N.J. Badu of Llano sent ore samples to Philadelphia and New York. Badu was one of those flamboyant characters who seems to flourish in Texas. A geologist by training, he is best remembered for numerous schemes to promote Llano and its surrounding environs in just about anyway possible. No doubt, he had high hopes for the mysterious greenish-black rock from Barringer’s hill. Sure enough, the samples were found to be composed primarily of a radioactive yttria mineral, known as gadolinite, that had previously only been found in small amounts in Russia and Norway. Because they were so rare, yttria minerals were extremely valuable. In 1887, pure yttrium brought $144 an ounce. In comparison, pure gold brought $19 an ounce on the London exchange that same year. Because the minerals from this deposit were so valuable, they were wrapped in tissue paper, packed in iron-bound boxes, and shipped by express at 100 pounds a box. At best, obtaining each pound of ore cost $10.00. As is true when anything of great economic value is found, the discovery of gadolinite at Barringer Hill triggered the interest of the rich and famous, in this case two of the most important inventors of the nineteen century: Thomas Edison and George Westinghouse. The race for control of the area began when William E. Hidden, a Newark, New Jersey mineralogist with connections to both companies read a newspaper account about the discovery. At that time, Edison and Westinghouse were looking for gadolinite to use in the creation of a filament for electric light bulbs but had found no accessible sources of the mineral. Never one to miss an opportunity, Hidden dispatched Dr. William Niven, a Scottish born Texan, to investigate Barringer Hill in 1889. Niven identified forty-seven minerals there, including five previously unknown rare earth elements: fergusonite, monofergusonite, thorogummite, yttrialite, and rarest of all, nivenite. Years later, Hidden experimented on all the Barringer Hill minerals to ascertain the extent of the “new” form of energy present (e.g., radioactivity). When radiographs were produced by exposing photographic plates to the minerals in the dark, Nivenite produced the most beautiful radiographs because of its pronounced radioactivity. Hidden then commissioned Niven to buy the land. In 1889, during Niven’s second trip, Barringer agreed to sell his land through Hidden and him to the Piedmont Mining Company of London, England (which was owned by Edison.) Depending on the source, the company paid him either $5000 or $10,000 in gold because that was the only way he would take anything in exchange for his land. The gold was picked up in Burnet by Barringer and seventeen year old Tad Casner of Llano County, who was serving as his body guard. Although Edison experimented with all 47 Barringer Hill minerals, by 1903, the company could find no use for any of them. Amazingly, during the same year, a German chemist named Hermann Nernst, working for Westinghouse, developed a street lamp that used raw gadolinite as a filament. Later, Nernst would become famous in his own right for discovering the Third Law of Thermodynamics (entropy approaches a minimum at absolute zero), which he won a Nobel prize for in 1920. His original design for the lamp required modification, however. Initially, the Nernst lamp had a life of only two hours. Soon, this number was increased to seven hundred hours by another Westinghouse engineer, Marshall Hank. The lamp’s design was also modified to accommodate a filament consisting of 25 percent yttria and 75 percent zirconia. These ingredients were made into a paste, squirted into strips, baked, and then cut into the proper lengths. When the mixture was cold, it was nonconductive, but after being heated, it became a conductor that gave off a brilliant light with wavelengths penetrating deep into the infrared. With its technical problems solved, the Nernst Lamp Company, no doubt a subsidy of Westinghouse, decided to put the lamp into production and bought Barringer Hill through William E. Hidden. During the winter of 1902-03, the Nernst Lamp Company sent Hidden, himself, to begin excavation. For four months that winter and six months the following year, a dozen or so miners worked full time for the company, including Tad Casner and Barringer, who was probably once again somewhat of a laughing stock for not getting as much money as he could have for the land. Work was slow because the minerals appeared in pockets. The miners struggled to remove ore using picks, shovels, and dynamite to quarry rock from open 40 foot deep pits around the edge of the mound. Despite the difficulty of their task, the men made progress. By 1904, they had blasted away the top of the hill. A 30 foot high quartz pillar, however, was left standing in the middle of the quarry because it contained almost no rare earth minerals. Hidden and the miners made many curious discoveries about the minerals at Barringer Hill. Masses of purple and green coarsely crystallized fluorite up to 400 pounds were fairly common, as were enormous crystals of feldspar, some over five feet in diameter. From a cavity big enough to hold a horse, the miners removed a 600 pound single smoky quartz crystal which measured 43″ X 28″ X 15″. More ominous still were crystals taken from areas where the rock matrix contained radiating lines that resembled stars. The stars possibly formed when rare earth elements crystallized from the magma before the quartz in the matrix did, thus causing the quartz to crack as it accommodated itself to the incompressible crystals. Hidden writes that while removing a mass of mixed zirconium-yttrium-uranium and thorium ore from one of the stars, his hands and face began to burn as if from the effect of strong sunlight. After two or three days of mining, he felt soreness in the parts of his hands and face that had been directly exposed to the minerals. My assistant (Mr. J. Edward Turner) asked me “if these minerals could be poisonous?” As no arsenic was present . . The thought came to me that this action might be the work of a radio-active element and it is offered now more as a suggestion than as a proven fact. William Hidden was not the only employee Nernst/Westinghouse sent to work at Barringer Hill. In 1903, Marshall Hanks, the engineer who had improved the Nernst Lamp, arrived to run the mining operation. Although Hidden, at least in his writings, seemed to find no fault with the Hill Country or its inhabitants, Hanks did not fare as well. Hanks was unpopular with the miners because he kept secrets from them. In addition, he had heard many stories about what murderers and scoundrels Texans were. The miners, therefore, took every opportunity to play pranks on this “green as a gourd” Yankee. In 1904, Westinghouse had enough gadolinite to suit its needs and decided to recall Hanks. Availing themselves of this last, great opportunity, the miners decided to play one final trick on their boss. At that time, Wells Fargo was in charge of shipping Barringer Hill ore out of Kingsland by train, so the miners brought the Wells Fargo express agent in on the prank. The agent convinced Hanks that the only way he would get out of Texas alive was to mail himself to Pennsylvania in a crate of ore.
After he was loaded up, the miners pretended to search for him in the baggage car. Just as they threatened to shoot at the crates to flush him out, the agent bellowed out, “You fellows better not mess with Wells Fargo! Get out of this baggage car!” Hanks escaped in the crate and always believed the miners had wanted to kill him. Like Hidden, his life does not seem to have been cut short due to exposure to radioactive materials, and he went on to have an illustrious engineering career in Pennsylvania. For several years, the Nernst Lamp Company continued to annually extract a few hundred pounds of yttria minerals from Barringer Hill. Eventually, however, Nernst ceased operations as newer technologies surpassed the lamp. Other crystals found their ways into museum collections across the country. For instance, the Smithsonian Institute has a large, faceted piece of gadolinite that was once part of a neckdrop. Supposedly the radioactivity from this gem led to the premature death of its original owner. Hope springs eternal, however, because other deposits of rare earth elements exist in the Llano Uplift. There are at least a half dozen other plutons exposed in the area, each one covering 30 or more square miles. Previously unknown rare earth elements are also still being discovered from time to time. For example in 1975, a 5 cm X 5 cm sample of Texasite, a radioactive apple green mineral, was discovered in the Clear Creek pegmatite in Burnet County. Who knows what’s out there? Perhaps the next magnificent collection of minerals like Barringer Hill lies just beneath some pasture, road, or hill. Barler, Miles, Early days in Llano, 1905. Geologic Atlas of Texas: Llano Sheet, Bureau of Economic Geology – The University of Texas at Austin, Virgil E. Barnes Edition, 1981. Govin, Charles Thomas, Sedimentation survey, Lake Buchanan Texas. Thesis, University of Texas at Austin, 1973. Hess, F. L., Minerals of the rare-earth metals at Baringer Hill, Llano County, Texas: U.S. Geol. Survey Bull. 340, pp. 286-294, 1908. Hidden, W. E., Some results of late mineral research in Llano County, Tex. Am Jour. Sci., 4th ser., vol. 19, No. 114 – June 1905, pp. 425-433. Highland Lakes north, Buchanan, Inks, L.B.J., and Marble Falls Lakes; contoured depth aerial map for the fisherman, boat.. A.I.D. Associates, 1971. Landes, K. K., The Baringer Hill, Texas, Pegmatite: Amer. Min., vol. 17, pp. 381-390, 1932. Llano County centennial, Llano County Centennial Association, 1956. Oatman, Wilburn Jr. and Sarah Oatman Franklin, Llano Gem of the Hill country: Revisited, 1988, Anchor Publishing, San Angelo. Paige, Sidney, Description of the Llano and Burnet quadrangles: U.S. Geol. Survey Geol. Atlas, Llano-Burnet Folio (No. 183), 16 pp., 1912. Rob Reed’s Granite Page (http://uts.cc.utexas.edu/~rmr/)- an excellent site covering not only research into the granites near Barringer Hill, but also the geology of the area. Yarbrough, C.L., Canyon of the Eagles: A History of Lake Buchanan and Official Guide to the Vanishing Texas River Cruise., 1989. Lower Colorado River Authority, Lake Buchanan Fishing, Recreation, and Tourism Map, (Contours from August, 1991 LCRA Hydrographic Survey), LCRA, 1993.